Don't miss your opportunity to own these amazing pieces of history! 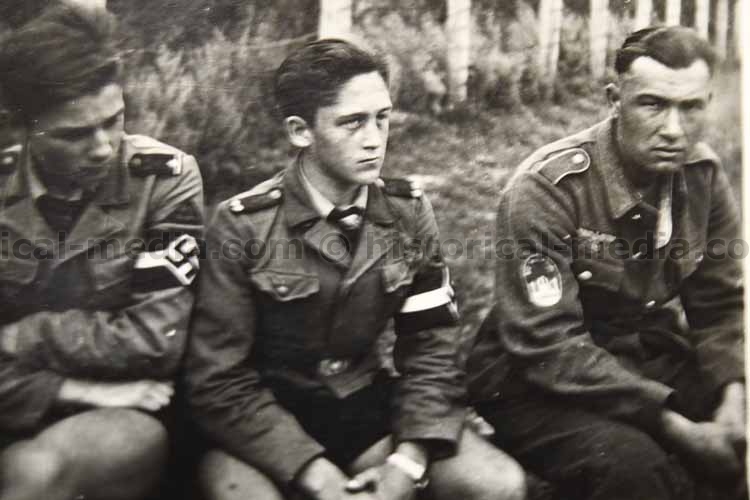 Waffen-SS FIVE Photo Album Group - Leibstandarte SS “Adolf Hitler” + FÜHRERSCHÜTZKOMMANDO OBERSALZBURG!! 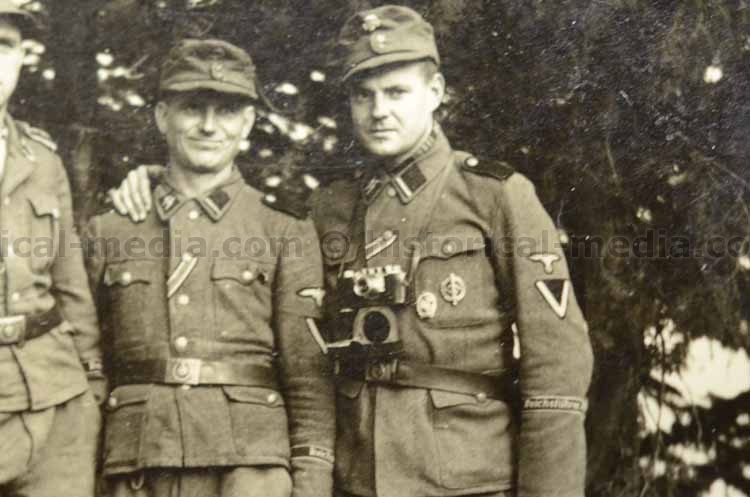 605 photos in FIVE photo albums, all from the same Waffen-SS man!! He served in VI./LSSAH and also FÜHRERSCHÜTZKOMMANDO OBERSALZBURG - Hitler’s personal SS guard at the BERGHOF! 559 photos! Named to SS Rottenführer Gottfried BIEHLE. 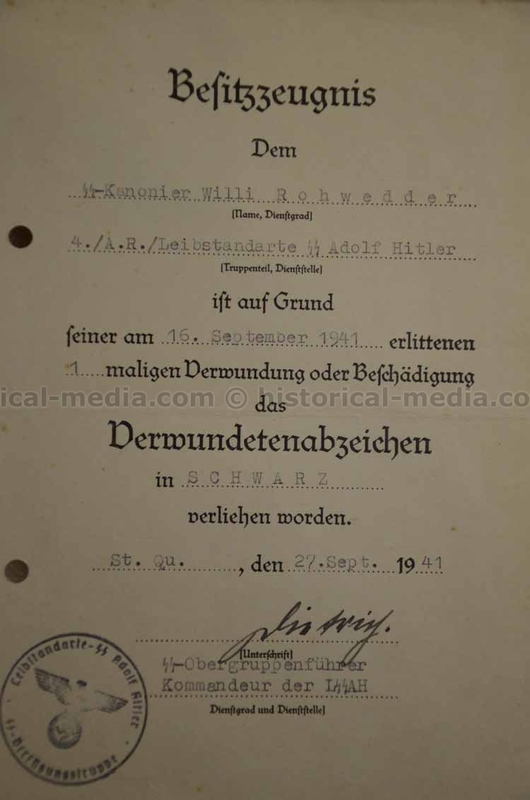 Comes with VERY nice promotion document to SS-Rottenführer dated Dec 12, 1940 with ORIGINAL signature Wilhelm MOHNKE!! Album 1: 181 photos. There is a SUPER studio portrait of him with LAH slip on shoulder board ciphers and Infantry Assault Badge. He has a baby face so is easy to spot through the album. 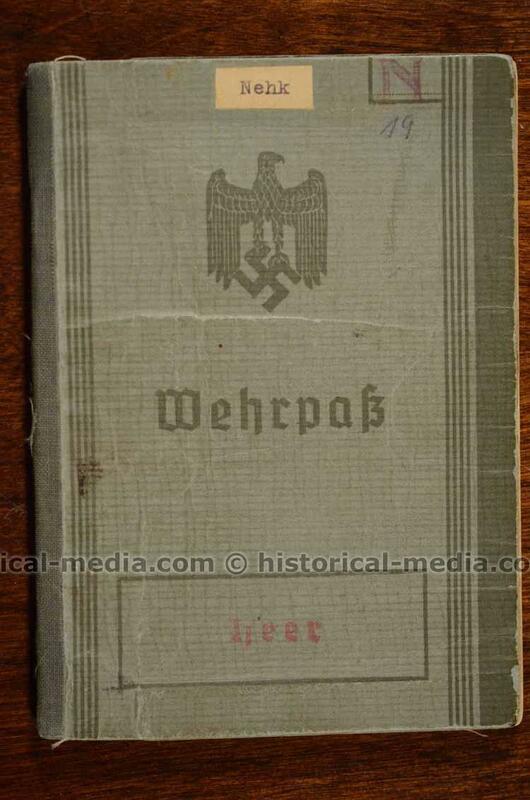 Starts with a SUPER photo of HIMMLER & HEIDRICH leaving building together in Berlin, FOUR original photos of HITLER, good photos from LAH Kaserne in Berlin, photo of him on watch duty at the kaserne photos of his barracks room, pass photos of him in SS uniform, on honor guard duty for Hitler at parades, weapons training, pass photos of other SSLAH comrades, then photos in the SUDETENLAND Campaign, several identified locations including several ethos from Zilnia, then photos of him assigned to FUEHRERSCHÜTZKOMMANDO OBERSALZBURG! He was part of the Hitler’s personal SS guard at the BERGHOF!! 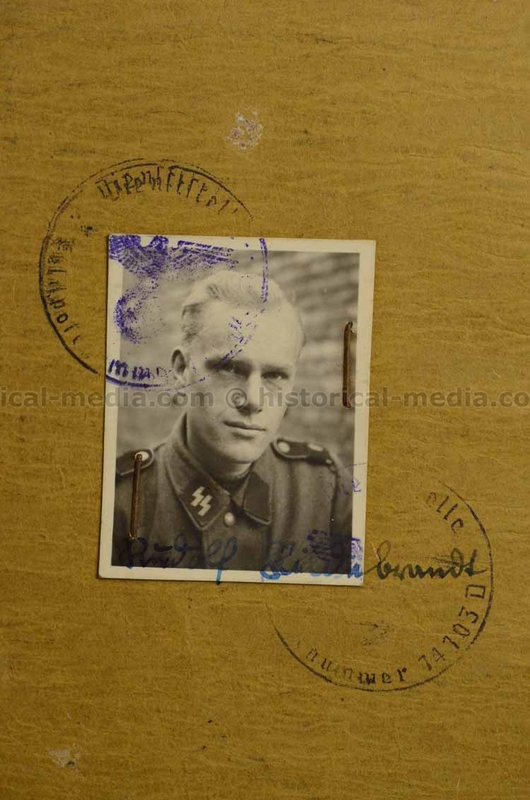 [Most of the Berghof service photos have photo shop stamp on reverse from Berchtesgaden] Beautiful large photo of the Berghof from across the valley, great photos of the Berghof, he and comrades marching past the Berghof, photos him on the balcony of the Berghof, great photos of the SS BARRACKS, on leave hiking nearby, parade ceremonies in Berchtesgaden, amazing photo he took looking inside the great window of the Berghof - doubly rare as the window is lowered(!! 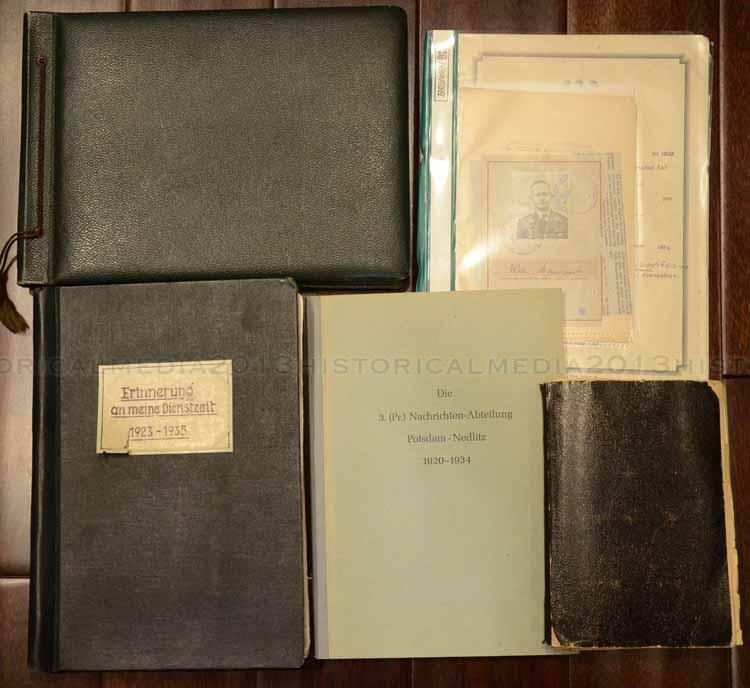 ), SIX original photos of HITLER visiting and touring the SS Berghof Barracks, several photos of Hitler’s personal adjutant Otto GÜNSCHE can be seen in these photos, the Plattendorn at the Berghof, and more! 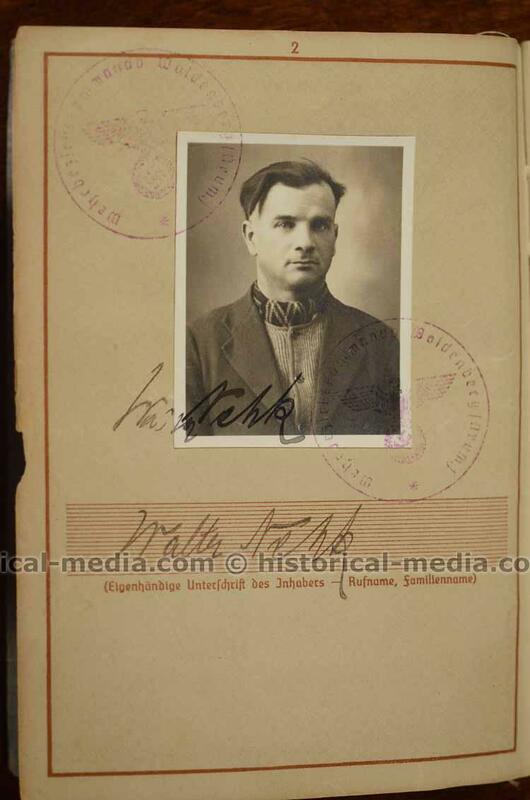 Then he is transferred for service in the POLAND CAMPAIGN - original private photo of Sept DIETRICH, photos of JEWS expelled from Polish towns, Polish POWs. 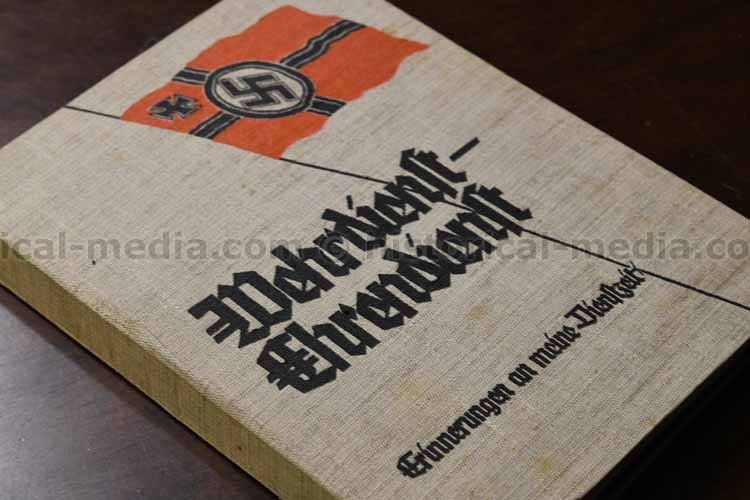 destruction, Panzers , armored train, good MG positions, original photos of SS-Obersturmbannführer Rudolf SANDIG (RK winner), very nice LAH parades in PRAGUE and more. Amazing album! Album 2: 168 photos, well captioned throughout. Starts with him in SS service on the Rhine in 1939, then service in the France Campaign, good photos from Rotterdam, SS camp smocks and helmets in wear rolling through Rotterdam, knocked out Dutch bunkers, crashed planes, great photo of SSLAH officer talking with Dutch POW, rolling through Amsterdam, photos from Arnhem, great photos of SS graves including a super close up showing SS Belt buckle they affixed to man’s cross, knocked out French tanks, many French POWs, many other identified locations in France & Belgium, photos from Paris, great original photo of the man standing behind SEPP DIETRICH and HITLER at a dinner in Metz, then photos from BALKANS and GREECE, then photos on leave visiting SS Kaserne in OBERSALZBURG/Berghof! 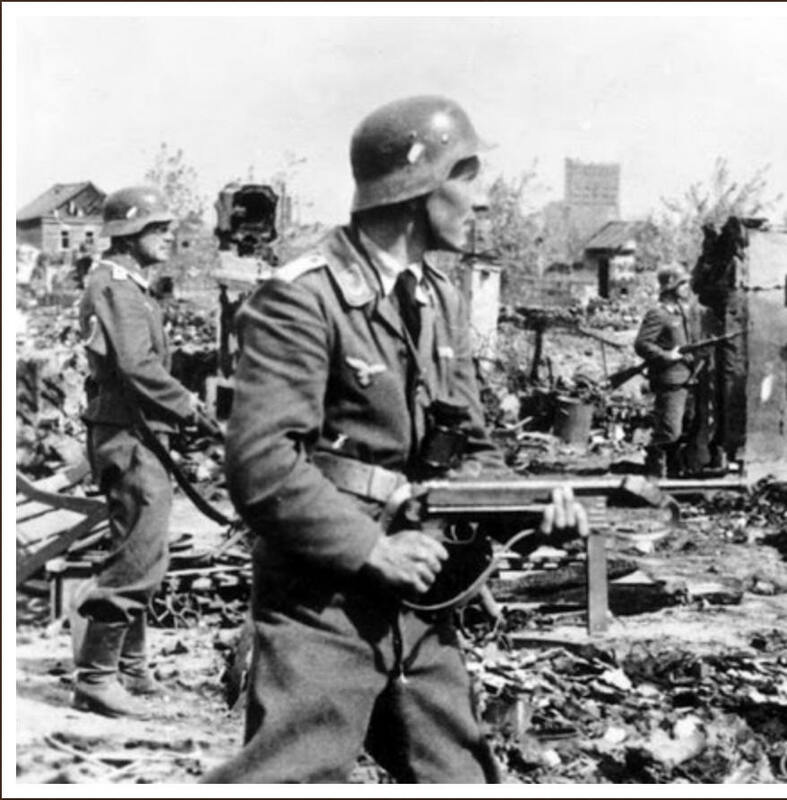 He previously served there as part of the FUEHRERSCHÜTZKOMMANDO OBERSALZBURG! Great photos of Platterhof, Berghof, SS barracks, etc. Album 3: 134 photos, well captioned. Starts with him and his unit at the BERGHOF!! 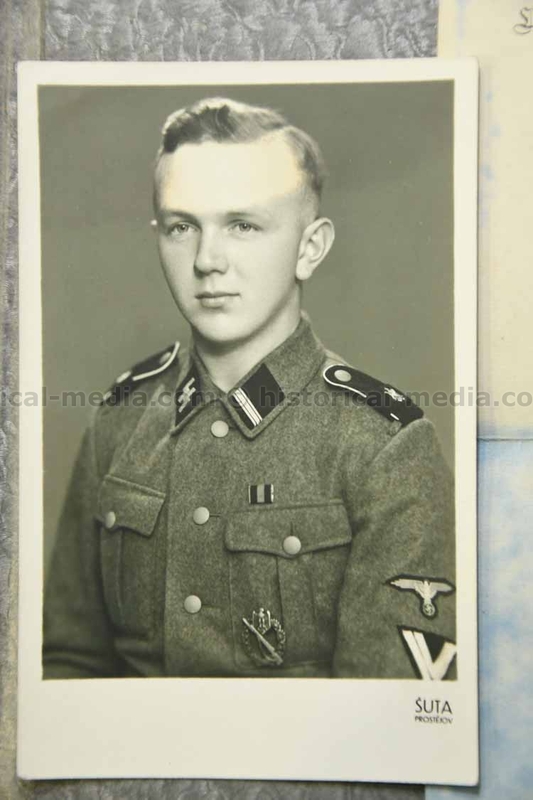 Many good photos of the Berghof, SS Barracks at the Berghof, Platterhof at the Berghof, then photos from training at Sennelager at Paderborn, MO40 and Mg 34 training, mortar squads, SS camp smocks and helmet covers in wear, then shipping out to RUSSIA, photo of him on day of his EK2 award, SSLAH cufftitles in wear, several nice SS postcards, SS vehicles, then transfer back from France in 1942photos from Paris, funeral ceremonies in France, and more. Album 4: 46 photos and postcards. nice grouping of SS combat related postcard images, then photos of him attending a ski training course in 1944. 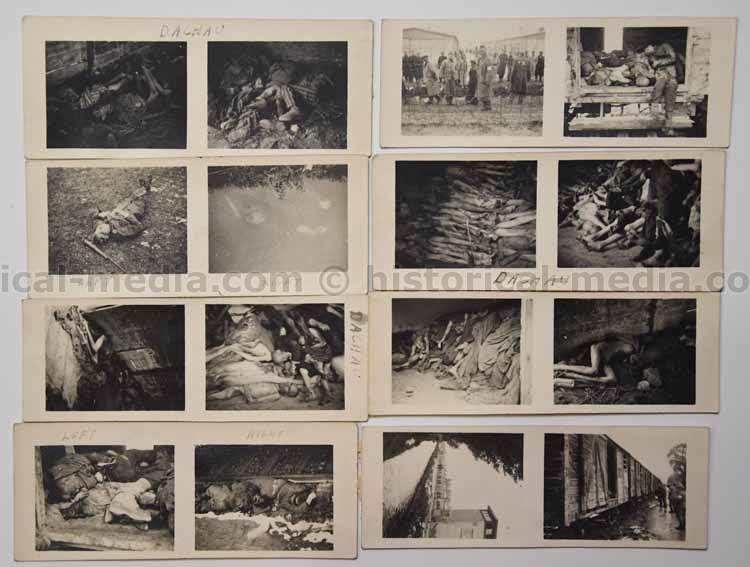 16 original wartime photos taken by a US GI of DACHAU Concentration Camp. 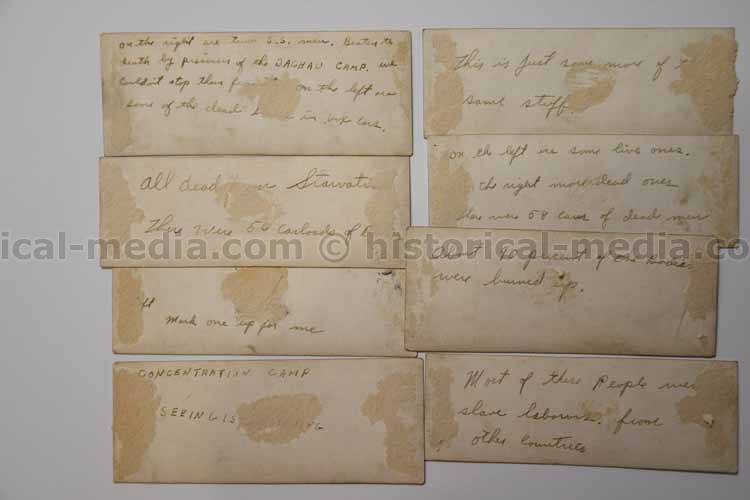 All with hand written captions on reverse. 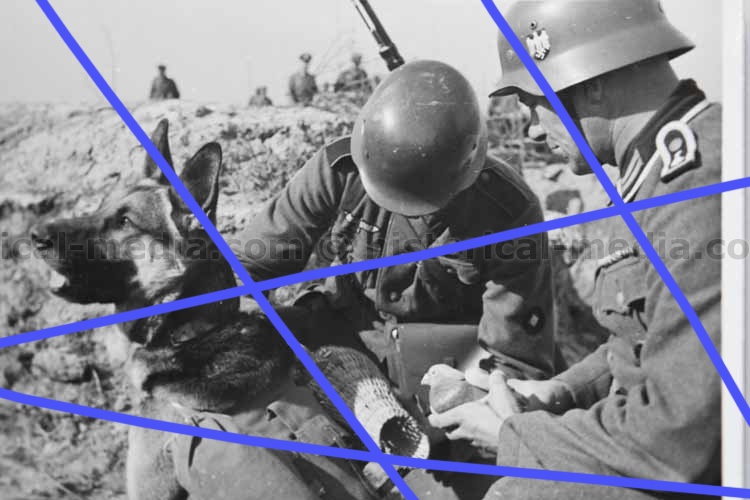 36 ultra rare original photos of a Germany Army Dog & Pigeon unit in the field, Amazing images, all publishable. Showing great, sharp detail of all manner of Dog/Pigeon equipment, carrying devices, field operations, etc. 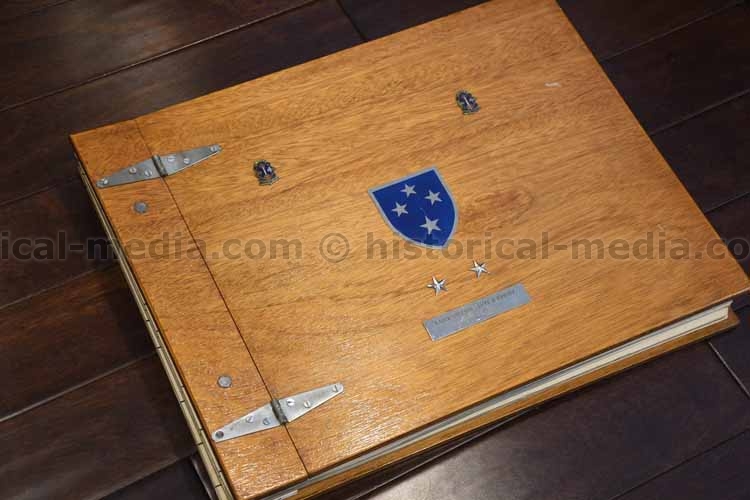 A fantastic photo album, from personal estate of Major General Lloyd B. RAMSEY. Ramsey had very colorful service from WWII through Vietnam. During WWII he served as Aide-de-Camp to British General ALEXANDER during the North Africa Campaign, participated in the Battle of Kasserine Pass, he and his unit were the FIRST to BERCHTESGADEN (Sorry 101st AB, it wasn't you), was present at the raising of the American Flag over the Eagle's Nest, and recipient of multiple Purple Hearts, Silver Star and multiple Bronze Stars. During Vietnam, he served as the commander of the Americal Division. This album covers his Vietnam service. It is a MASSIVE, heavy thing, hand made from wood with personalized engraved name plate on cover. 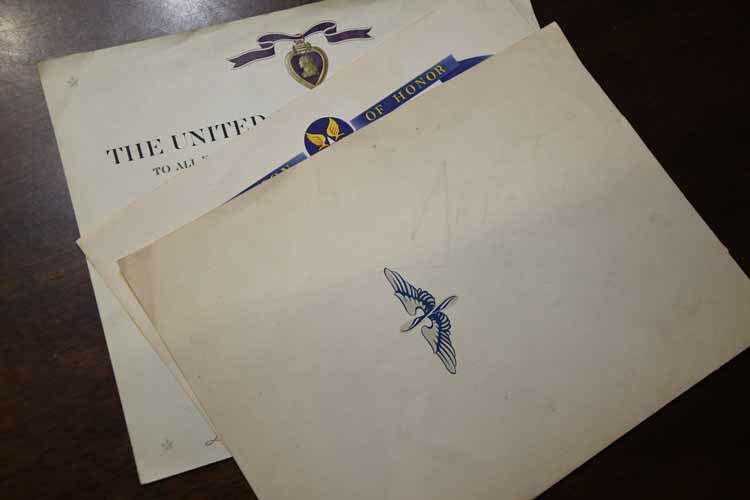 Also comes with award document from South Vietnam and a large pile of letters, many from other Generals and high officers as well as Ramsey's response letters, after his injury from an in country helicopter crash. The album is filled with excellent photos - many excellent color photos, everything you would want to see, combat, many named officers (including NORMAN SCHWARTZKOPF and COLIN POWELL), tanks, heavy weapons, on stage with Bob Hope, helicopters, Ramsey receiving medals, many articles about significant battle he commanded, photos of his helicopter crash and him recovering in hospital and much more! A historically significant album! WWII RAF Trunk Grouping - NAVIGATOR - Very Complete Grouping! 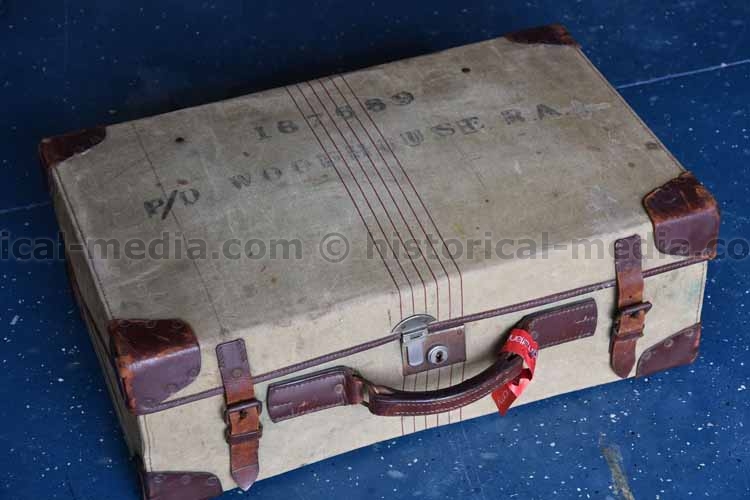 VERY nice trunk/suitcase grouping named to P/O Raymond A. WOODHOUSE. Original suitcase he brought/shipped his effects home in is in very good condition. It survived me checking it as luggage back from England last week! It is full of, likely, everything he brought home, Comes with a very nice, professionally framed display of his War Medal, Cap Badge, Nav WIng, photo and ID tag. On the reverse is a copy of his Record of Service from the RAF. 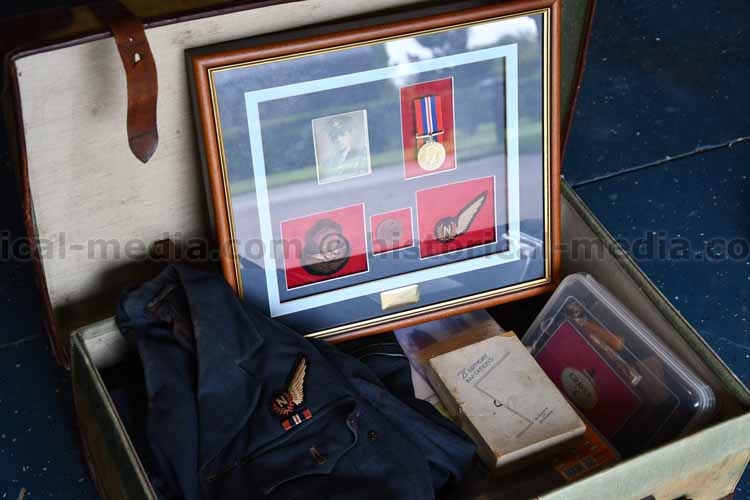 Comes with his officers flying tunic with label from Moss Bros & Co Ltd., Covent Garden, London, his officer's greatcoat, also from same tailor, period framed group photo, his painted RAF duffle/kit bag, ID tag, medal boxes and insert letters, Flying LOG BOOK & RCAF Sight Log Book (mostly training in Canada, he did make it over to the CBI theater after the war - he was assigned to TFU Defford in July 1945), his RAF Paybook, RAF Service & Release Book, various other ID cards and booklets, invitations, box of various uniform effects - buttons, extra pair of shoulder boards, etc., a nice lot of photos showing aircraft, him and comrades in uniform, base life, photos when he was posted in India, several maps he used in flight, engraved lighter in box, and more. great grouping that would make a very nice display. Panzer Assault Badge "25" Wehrpass & Document Grouping - PANTHER - 5x T-34 kills in one day - 23 Panzer Division - TOP! Amazing grouping named to Uffz. Erwin EIFLER He served in Panzer Regiment 201 from Oct 1941 to July 1943. The unit was renamed Panzer Regiment 23 in Aug 1943. He remained with the unit until war's end. Wehrpass is well-filled out. Lists all awards including Panzer Assault badge "25. "Alson contains a great list of compaigns. He was wouned in May, 1942 from a shell splinter. 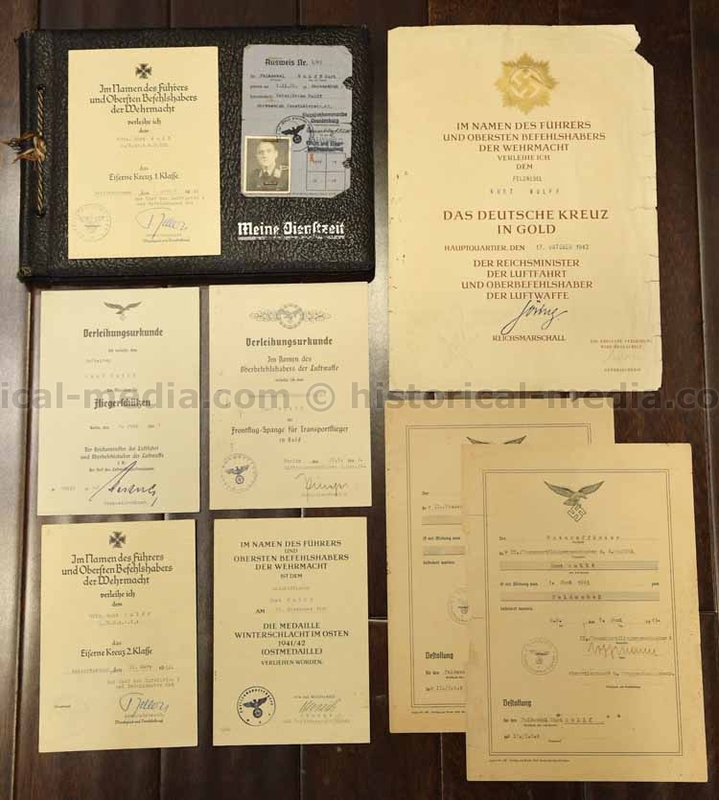 Comes with his PANZER ASSAULT BADGE award document with original signature 23 Pz Div commander Generalleutnant Hans Freiherr von Boineburg-Lengsfeld 9RK winner), PANZER ASSAULT BADGE "25" (II Stufe) wth original signature 23 Pz. Rgt. 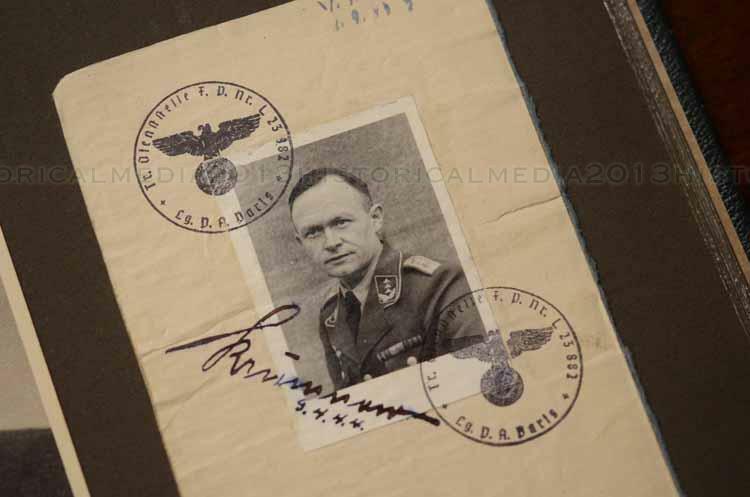 commander Major Fritz FECHNER (RK winner & rare signature to find!! 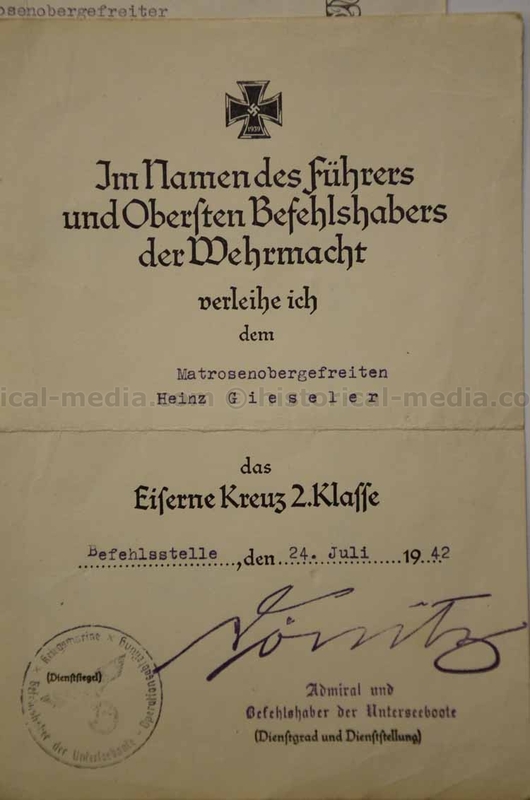 ), IRON CROSS FIRST CLASS award document with interesting unit "Division Panzer Kompanie "Rothe," with original signature 23 Pz. Div. 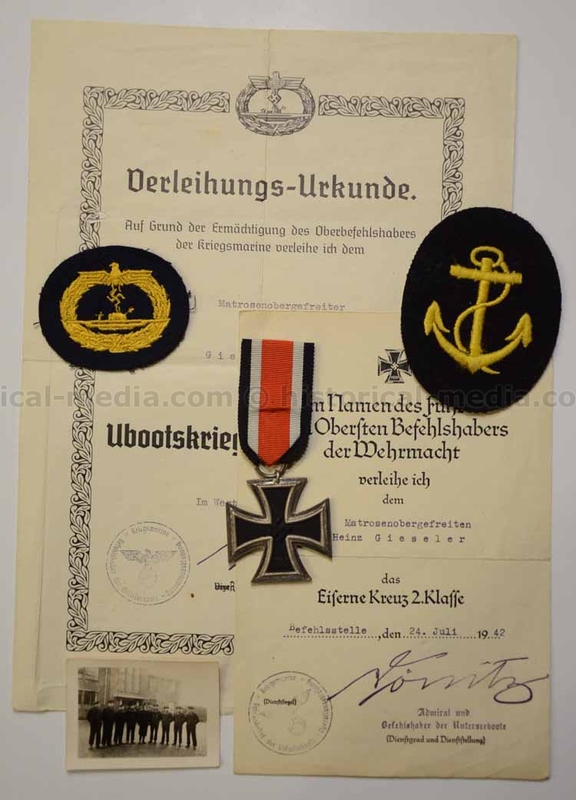 commander Generalmajor Ewald KRÄBER (DKiG), IRON CROSS SECOND CLASS, also with signature von Boineburg, BLACK WOUND BADGE award document with orig. si. Abt. 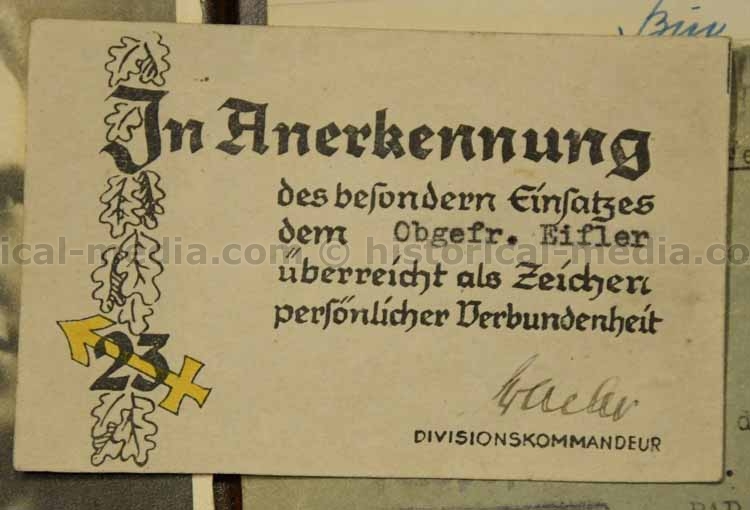 commander Oberstleutnant Georg-Hennig von Heydebreck (RK winner while commanding Fallschirm-Panzer-Regiment 1 "Hermann Göring"), a VERY RARE card awarded to Eifler for exceptional service with original signature 23 Pz. Div. commander Generalmajor Ewald KRÄBER, a complete listing of his STURMTAGEN - Panzer engagements qualifying him for the Panzer Assault Badge "25," and he was well on his way to the "50." documents confirming his 14 Sturmtagen qualifying him for the Panzer Assault Badge, amazing document commending him for action on April 4, 1944 - in his PANTHER Mark V tank, he knocked out FIVE T-34 tanks!! Also comes with a rare 23 Panzer Division unit reunion program with division emblem, a nice portrait photo of hi in Panzer uniform, Feldpost and more. 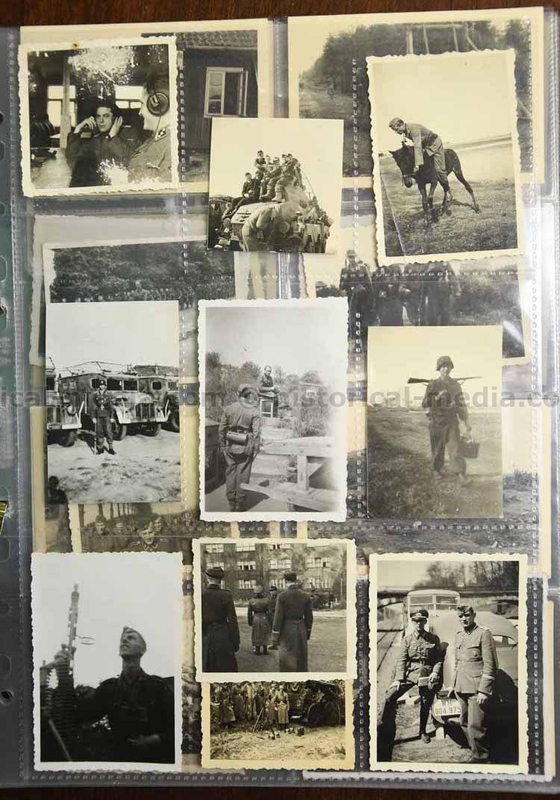 SS POLIZEI Photo Album Grouping - France Campaign - Panzer Jaeger Abtl. SS Polizei Division - Nice! 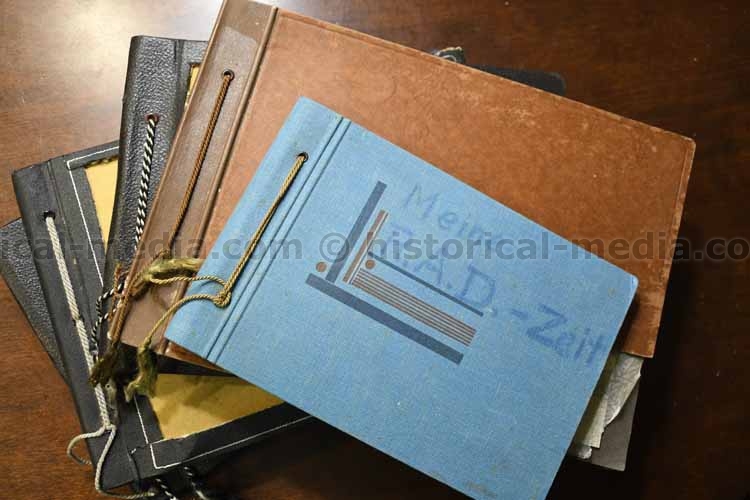 Two photo albums from the same SS Polizei man who served in 1./Panzer Jaeger Abtl. SS Polizei Division. 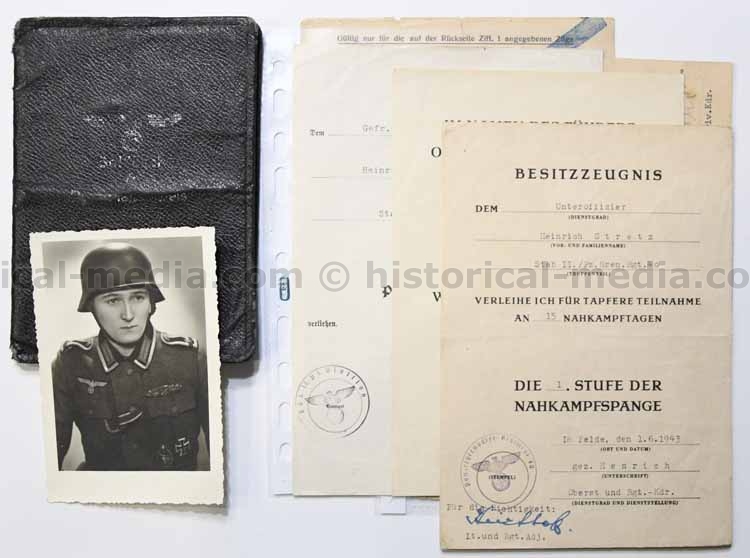 The first album contains 93 photos and covers his Polizei training and service starting in 1935. Well captioned. Good photos of him visiting BERCHTESGADEN, good Polizei uniforms, parades, vehicles, PAK training, Fahnentraeger, many photos from his service in Ludwigshafen. 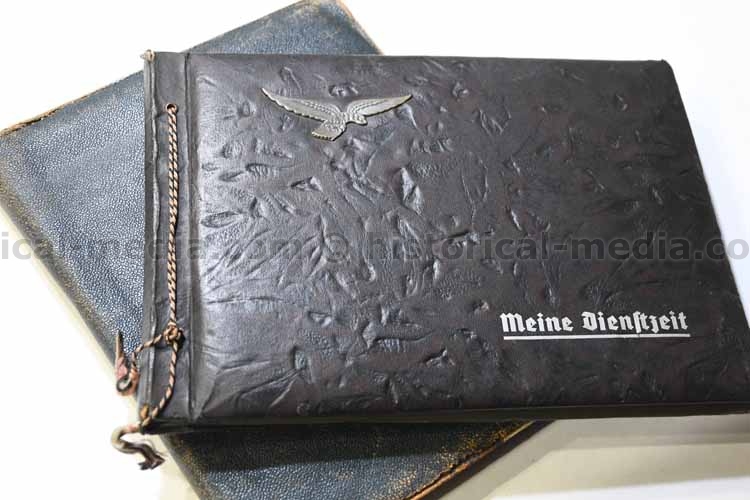 The second album contains 175 photos and covers his SS POLIZEI photos in the France Campaign, 1940. VERY good photos! Well captioned throughout, bunkers, KIA French soldiers, many good vehicle photos, excellent SS Polizei uniforms, crashed RAF airplanes, many identified locations in BELGIUM, destruction in SEDAN, good PANZER III photo, French Tankettes with German markings, French POWs, crossing the Aisne Canal, captured French tank, halftracks, many good photos of battle in LES ISLETTES, posing with French police at checkpoints, comrades' graves, visiting Paris, and more. nice content. 74 photos. Named to Gef. Karl PORRMANN who served in Sich Btl 966. Comes with his Wehrpass. He was KIA on March 2, 1944 in anti-partisan fighting in Poland. 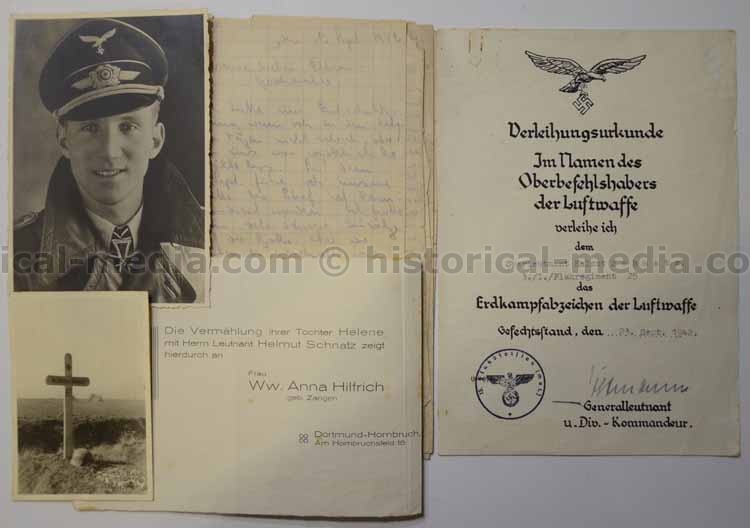 Also comes with his large funeral notice listing his death due to “Bandenbekampfung.” Letter to his wife from his commander giver her details about his death, letter indicating the unit is sending her this photo album that they put together for her, another hand-write letter to her from comrade. Photos include photos of his grave in Jaroslau, photos from his funeral ceremony including his coffin identified, photos of him and unit in anti-partisan fighting in the weeks before his death, Russian Asian POWS working for his unit, photos from their Lager in Demba, Poland, nice field portrait photo of him. HITLER JUGEND Photo Album - ADOLPH HITLER SCHULE SONDHOFEN - HJ Band in RUSSIA - Top! 140 photos. Very well captioned! Really good album of a HJ Führer. Very interesting content as he and his unit get sent to RUSSIA & the Ukraine in 1943 for some type of music duty there. Quite uncommon! 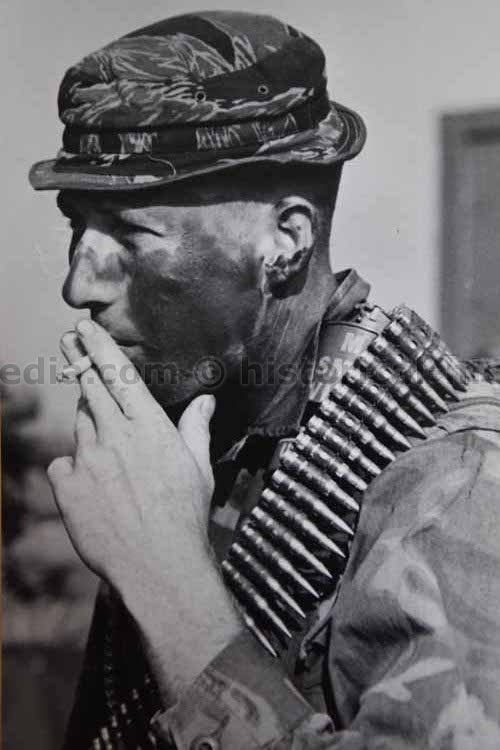 GREAT PHOTO OF GERMAN SOLDIER WEARING TURKISTANISCHE LEGION ARM BADGE!! Great photos of HJ uniforms, insignias, gear, parades, flags, attending ADOLF HITLER SCHULE SONTHOFEN, great AH music and instrument photos, performing in Ukraine, performing for troops in Lazarett, photos performing in Zwiahel and Winizza, postcard from Ordernsburg Sondhofen,back in Sondhofen after returning from Russia, , in training at BAD TOLZ (SS training school), and more. Adolf Hitler Schools (AHS) were National Socialist boarding schools (12 in total) created to indoctrinate the youth of Nazi Germany, which in many ways resembled the National Political Educational Institutions ("Napolas"); the AHS were counted among the National Socialist's elite institutions. Great album! 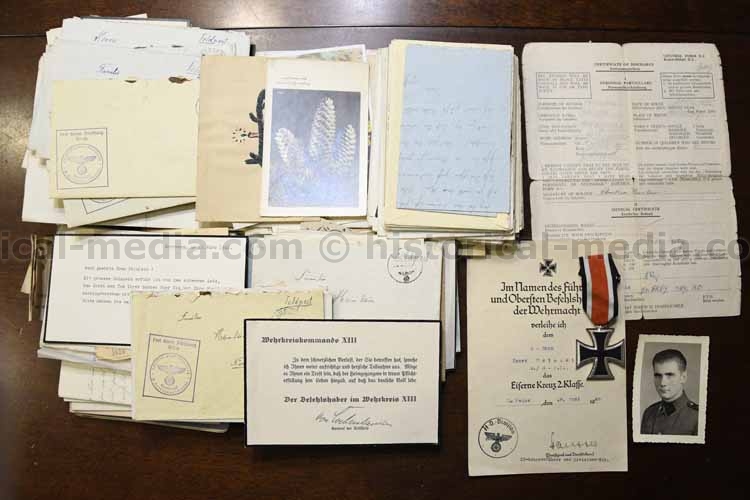 88 photos and documents of Hauptmann Wilhelm BURKHARDT who was a Kompanie commander in Inf Rgt 78 of the 26 Inf Division. He was KIA on June 5, 1940 during combat on the Oise Canal - very early in the France Campaign! 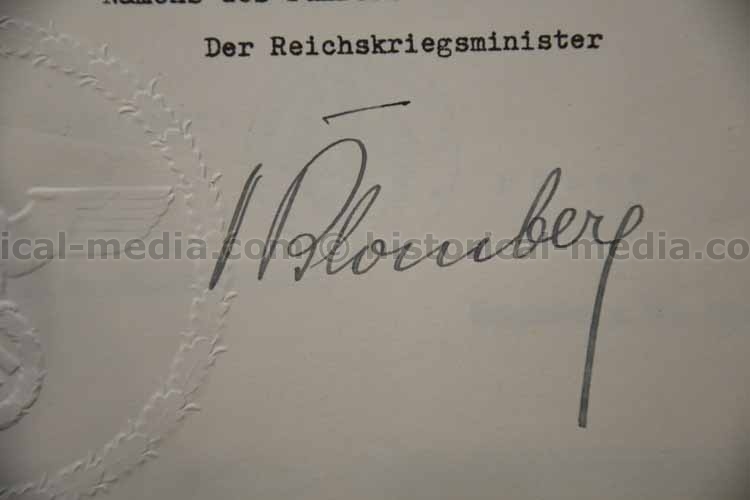 Comes with many documents including his promotion to Oberleutnant document with ORIGINAL SIGNATURE WERNER VON BLOMBERG! Four Yer Long Service Medal award document, other documents and citations form his time in the Landespolizei, his funeral notice, several letters from commander and comrades to his wife, several letters of congratulations to the man upon promotions, album is well captioned. Has a SUPER large portrait photo of him wearing helmet, good photos from 1938 of him and unit on parade, other studio portraits and more. Grouping to Uffz. Emil CHRISTMAN who served in Very. u. Kart. Abt. (mot) 613. 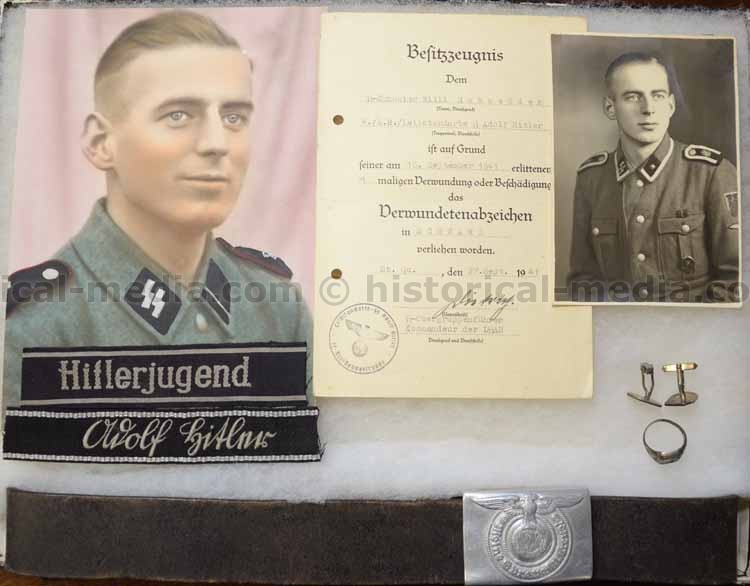 Comes with his KVK2 award document with original signature 12 Armee commander, General der Pioniere Walter KUNTZE (RK winner), SOLDBUCH & Wehrpass are complete and well filled out, Wehrmacht Fuhrerschein, RED Cross stretcher bearer oilcloth ID, military discharge. Named grouping to S/Sgt. Thomas J. KEEFE, Jr. He served as a BALL TURRET GUNNER with the 413 Bomb Squadron, of the 96th Bomb Group. At 1023 on January 4, 1944, Keefe was flying in B-17F #42-30518, Short Stride IV which collided with B-17F #42-5923, Skin and Bones. The collision occurred at 52⁰20’N 07⁰10’E at 25,000’. Both aircraft were from the 96th Bombardment Group (H), 413th Bombardment Squadron (H). B-17 #42-30518 crashed near Lingen, Germany and B-17 #42-5923 crashed near Gronau, Germany. 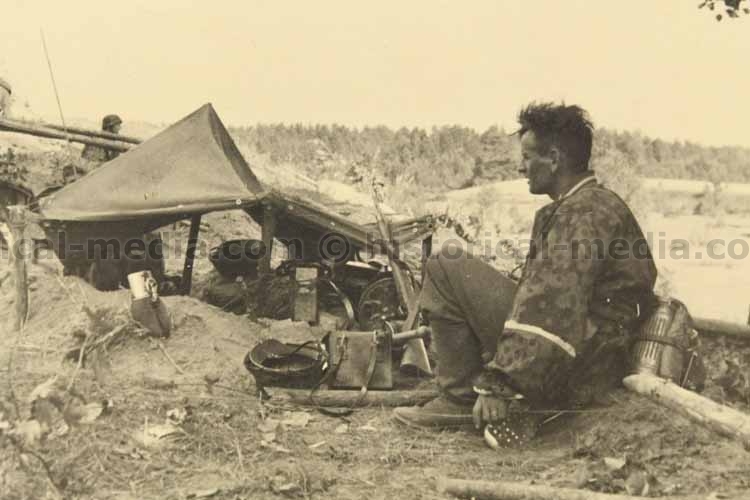 The radio operator, T/Sgt. Lyall W. Taubert; right waist gunner, S/Sgt Gerald R. Waldron, Jr.; and tail gunner, S/Sgt. John Y. Young on B-17F #42-30518, Short Stride IV, survived the collision and became prisoners of war. The pilot, 1st Lt. James E. McLean; the copilot, 2nd Lt. Harold Ziotnick; the navigator, 2nd Lt. John R. Gray; the bombardier, 2nd Lt. John E. McGee; the top turret gunner, T/Sgt. Richard R. Winn; the ball turret gunner, S/Sgt. Thomas J. Keefe, Jr; and the left waist gunner, S/Sgt. David Miller, Jr. were all killed in action. All ten crewmembers of B-17F #42-5953, Skin and Bones, were killed. The grouping comes with his fantastic condition B-14 Jacket, great BRITISH MADE 8th AF patch, DUC ribbon, British Made ribbon bars, VERY nice Air Gunner's Wings - scarce version without the "O" target behind the flying bullet, sterling pin back with clutch post seats - one of the best Air Gunner Wings you can find. Also comes with uniform pants, shirt, tie and belt. Family must have sewn the ruptured Duck insignia on as a memento since he was KIA in 1943. 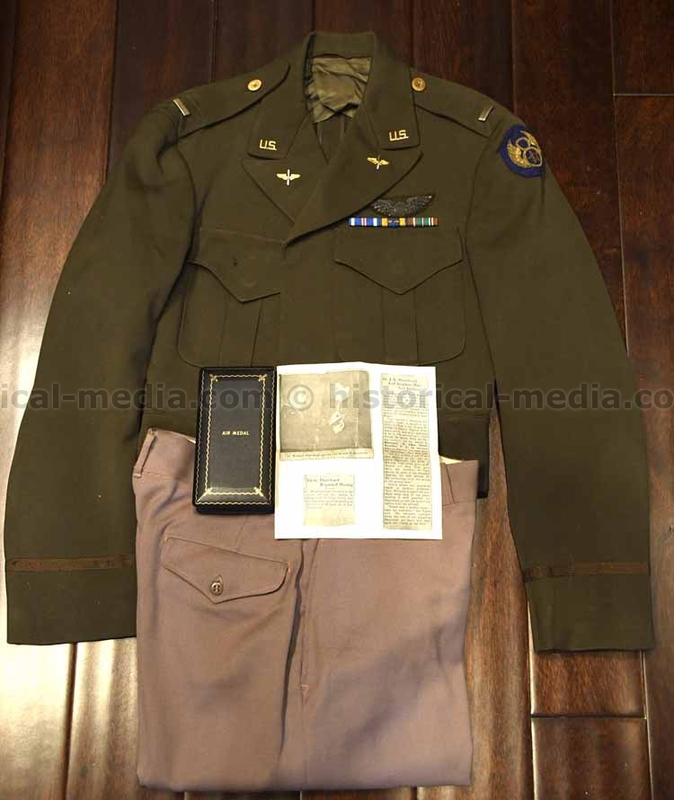 US WWII FIGHTER PILOT Uniform & AIR MEDAL Grouping - 357th Fighter Group - KIA ARNHEM - Market Garden! 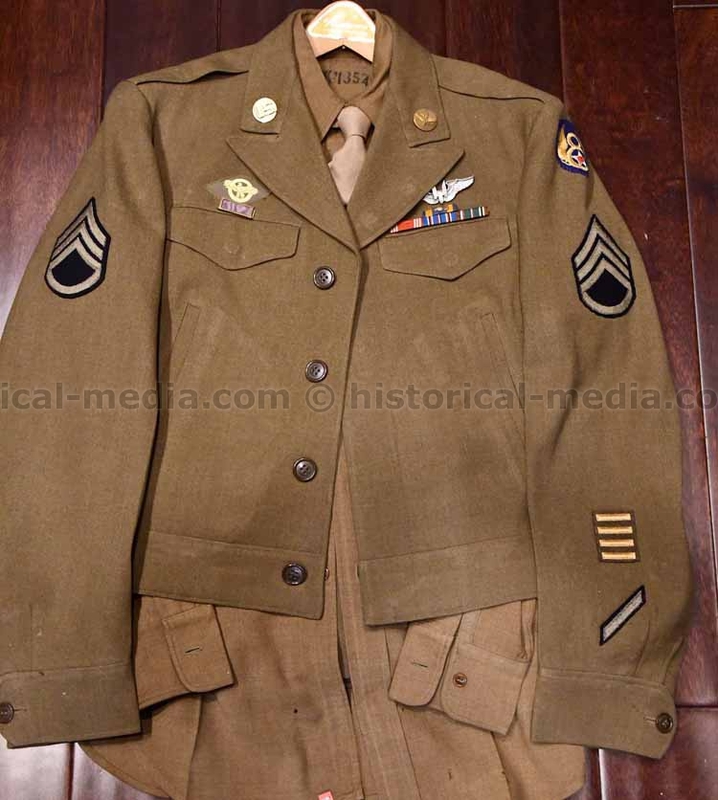 Very nice uniform IKE jacket, mint trousers (still with shop tag) to 1st. Lt. James L. BLANCHARD III - O-464693. Blanchard served with the 357 FG, 362 FS - "The Yoxford Boys." This was the FIRST P-51 Mustang unit in the 8th Air Force! Blanchard was credited with one kill - comes with copy of his claim document. He shot down an Me 109 on Sept 18, 1944 in the vicinity of NIJMEGEN, Holland during the second day of operation MARKET GARDEN! He was killed the day and was classified as "Failed to Return" (FTR) while flying area support mission for 1st Airborne to Arnhem in P-51D 44-13741 'Buddy Boy.' He was shot down by enemy fighters. Later classified as Killed in Action (KIA) 19-Sep-44. Comes with copy of his Missing Air Crew Report -MACR 8794. Also in the pockets of his Ike are copies of two news paper articles, one about him destroying a Ju-52 on the ground, a second about him being reported missing. Also a copy of newspaper photo of him being awarded the Air Medal (Group comes with this Cased Air Medal). The IKE is beautiful with a gorgeous BULLION 8th AF patch ($250 by itself), BULLION pilots WINGS, ribbon bars, 1st Lt bars. 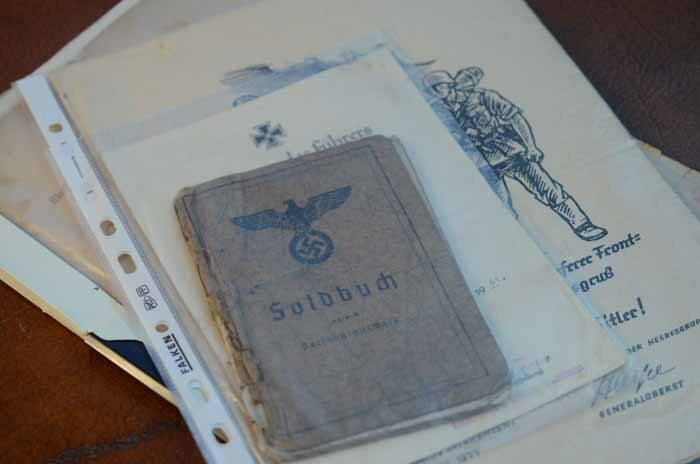 WAFFEN-SS MEDAL, SOLDBUCH & Document Grouping - SS-LEIBSTANDARTE - TOP! Amazing grouping to Rudolf HILDEBRANDT. Everything directly from his sister. 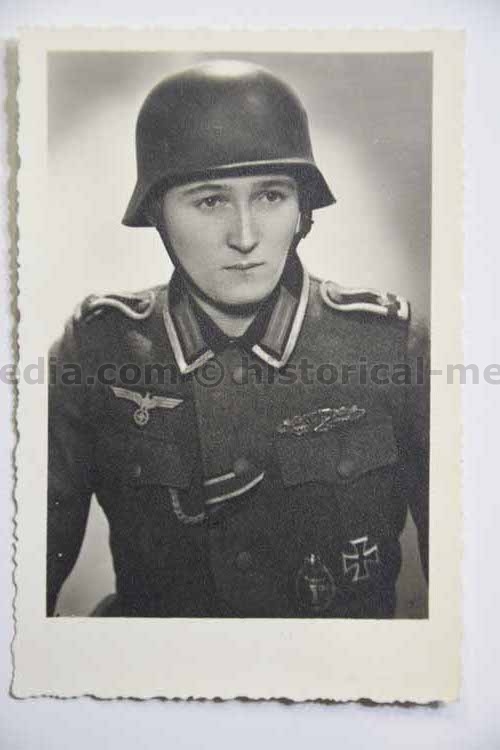 Comes with his original issue SS Soldbuch with SUPER uniform photo of him wearing LAH shoulder boards. 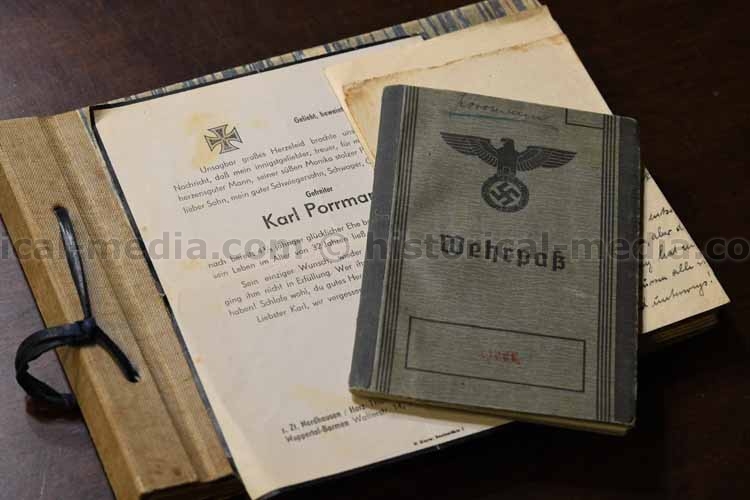 He was born in 1927 so he was 17 years old at the time the Soldbuch was issued! He served in 7./ SS Panzer Grenadier Regiment. Soldbuch has a great unit LSSAH stamp. He was hospitalized in Jan. !945 for shrapnel wounds and (likely )frostbite. He was hospitalized again in April 1945 in Bad Tolz due to an accident. 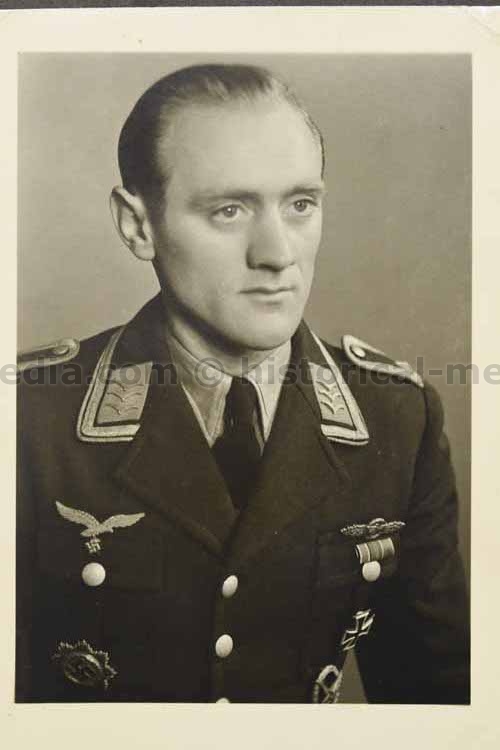 There are also POW camp entries showing him in Rgt 17 "Brasack" (SS General Kurt Brasack). 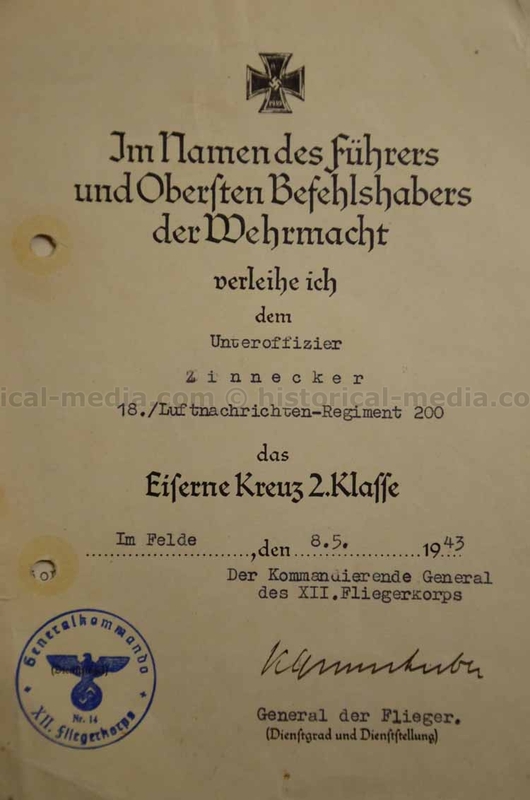 Award entries include EK2 awarded April 7 1945, "Pz Sturmabzeichen" - probably incorrectly entered & should be Inf Sturmabzeichen - obviously it would be PanzerKAMPFabzeichen otherwise. This is also the medal that comes from the family, and his NAHKAMPFSPANGE in Bromze. The last two both awarded on April 5, 1945. All three awards have the appropriate LSSAH unit stamp. 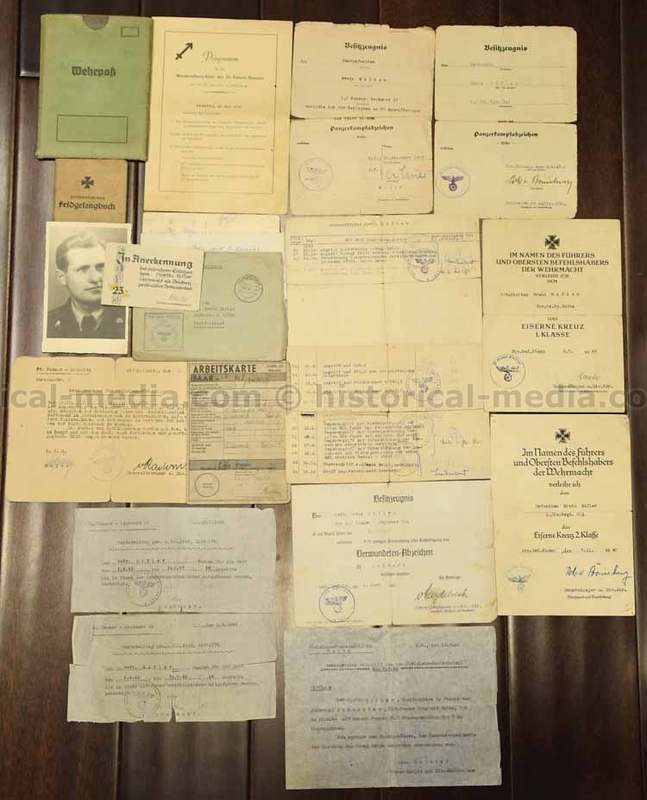 Also comes with his RAD Entlassungsschein, original military discharge document issued by US forces, 1952 Personalausweis, rare 1947 issue JUGEND-AMNESTIE document, hospital document related to his accident, and three nice late war photos - two in SS uniform. ORIGINAL medals include - Black Wound Badge, Iron Cross Second Class (maker marked on ring), Infantry Assault Badge in Bronze (maker marked FLL), beautiful CLOSE COMBAT CLASP in Bronze (maker marked Peekhaus), Ostmedaille, RAD cap Badge and one coin. I spoke personally with the man's widow. He is still alive but, sadly, suffering from severe dementia in a nursing home. 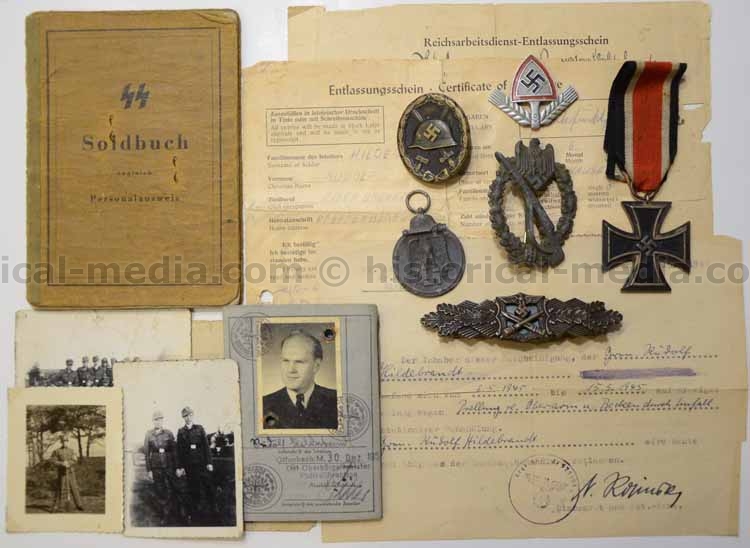 Waffen-SS Cufftitle, Photo Award Document & SS Effects Grouping - SS-LAH & SS-Hitlerjugend - RARE!! Very nice grouping to Josef ZINNECKER. 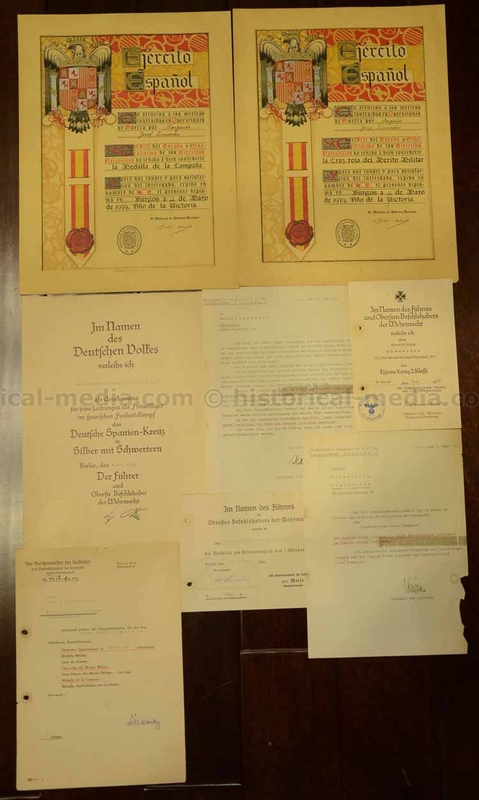 Comes with his two nice formal Spanish Medal award documents (Cruz Roja Del Merito Militar and Medalla de la Campana) - would look amazing framed, large formal SPANISH CROSS in Silver medal award document, official document identifying the medals he was being awarded for Legion Condor service, Sudetenland Medal award document, Iron Cross Second Class award document (18./Luftnachrichten Rgt 200) with original signature XII Fliegerkorps commander General Josef Kammhuber -RK winner -for DAK service, letter to his family stating that he was being awarded the EK2 for service in AFRICA, second letter to his family saying he was captured in TUNISIA by Allied forces and also awarded the EK2 medal. 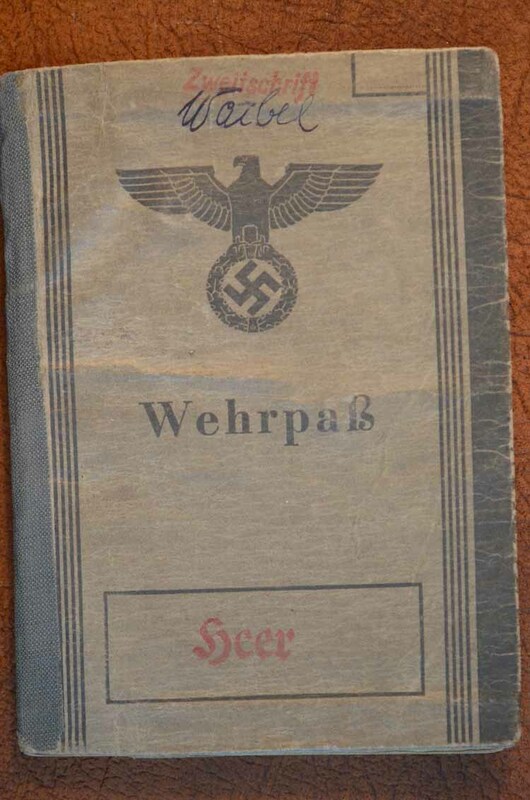 Waffen-SS Photo Album, WEHRPASS & Documents - 16th SS Panzergrenadier Division "Reichsführer-SS" - RARE! Amazing grouping to man who served in SS Artillerie Rgt 16 of 16th SS Panzergrenadier Division Reichsführer-SS! A rare unit to find material from since it was formed so late in the war. Contains appx 100 photos including many photos where the man can clearly be seen - matching his other ID photos in the grouping. great photos of him waring Reichsfuhrer SS cufftitles!! 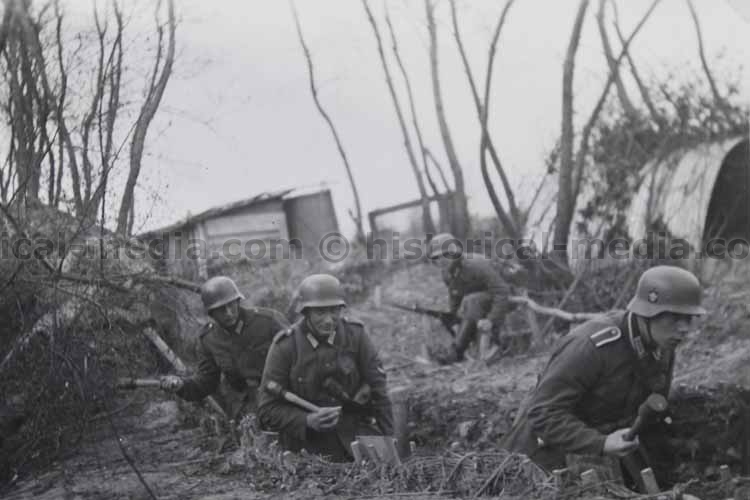 great SS came uniforms in wear, combat, MANY RARE photos form the unit’s time fighting in Northern ITALY after May 1944! 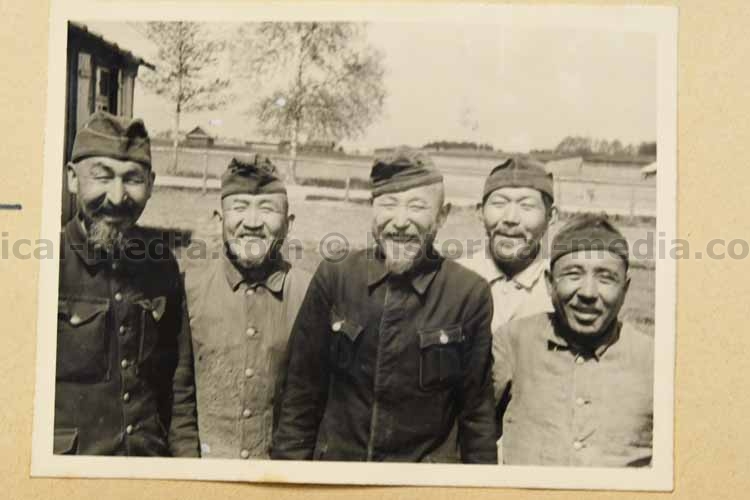 Also photos from his time with the unit after its transfer to HUNGARY in Feb 1945. 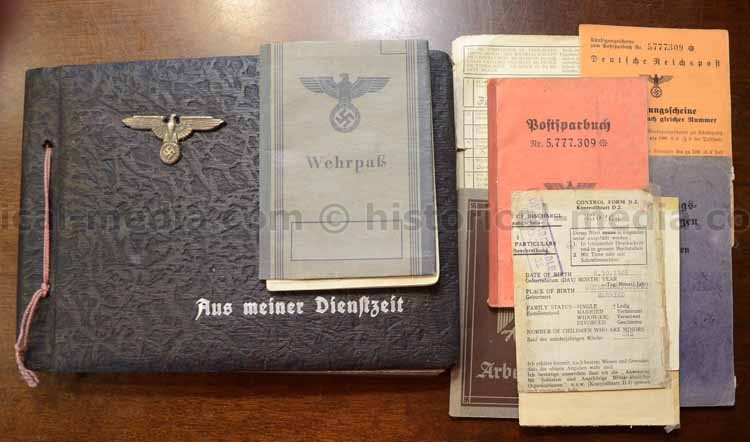 Also comes with his original WEHRPASS, Military discharge (matching units with Wehrpass), and other documents! Rare grouping! Luftwaffe Officer 3x Photo Album. Diary & Award Document Grouping - Nice! USAAF Medal, Squadron Patch, DIARY & Document Grouping - CATERPILLAR CLUB - Top! Super grouping to S/Sgt. Herbert N. ABBOTT who flew the 825th Bomb squadron, 484th Bomb group. Was part of the James CHAFIN crew. 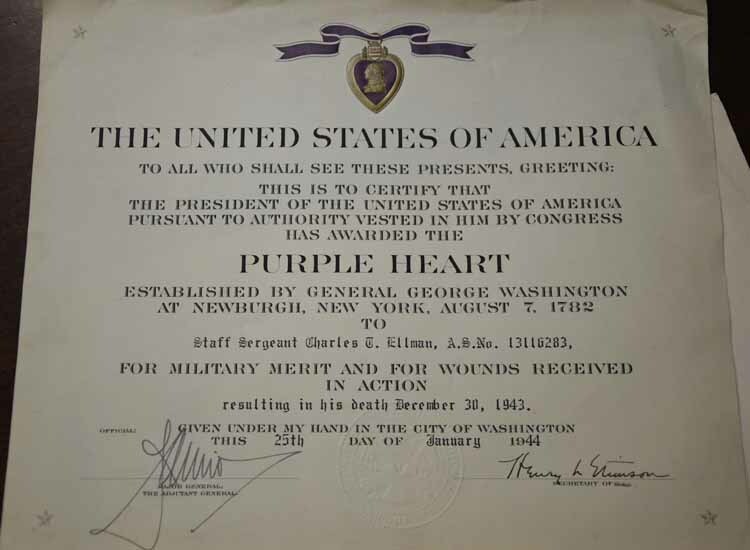 Comes with his Purple Heart & Air Medals in original cases, original discharge, his silk escape and evasion map, large framed portrait photo, official wartime transcript of his combat missions, original discharge, original wartime photo of his B-24 in flight (8x10in), ORIGINAL WARTIME DISNEY Italian made Squadron Patch (824th) - very RARE example, impossible to find, super Italian made Ribbon Bar, Italian made Purple Heart Ribbon, Air crew wings, extra patches and rank chevrons. Comes with his ORIGINAL WARTIME Caterpillar Club certificate (not post war reissue). 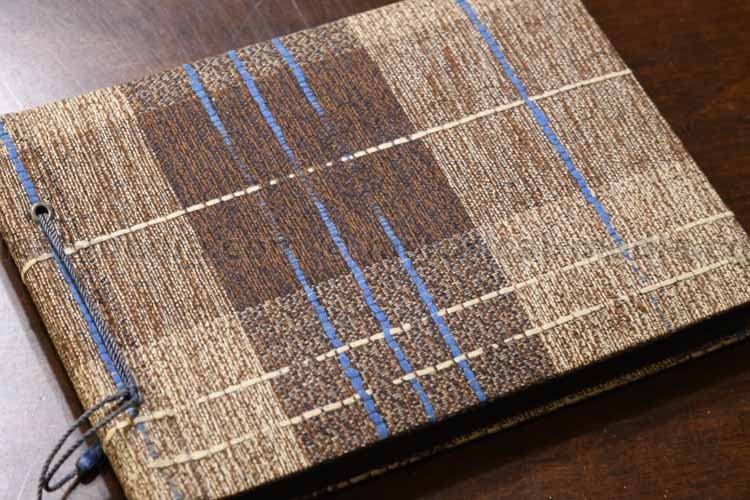 Also comes with his DIARY - which is incredible! 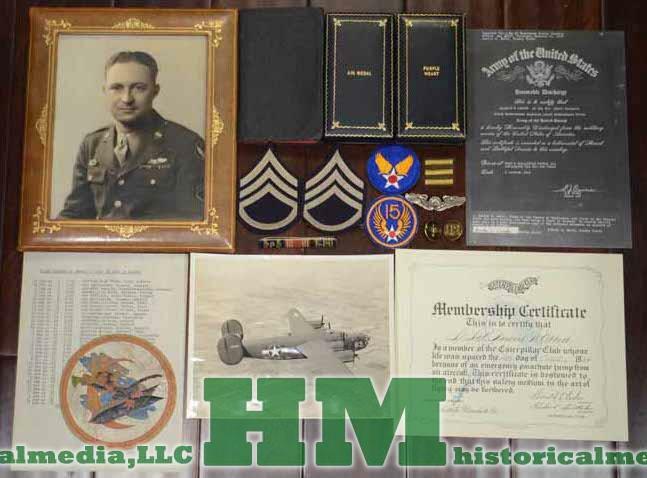 Starts with his trip "over the pond," following with very detailed entries about all of his missions including Oct 14, 1944 when, on mission to Blechhammer Germany, they had to bail out due to two engines catching on fire. Very detailed account of this and event... and rest of his missions! Super group. Original Wehrpass to man who served in Inf Rgt 322, Reiterabt, 285, and Ost Batl 633. Last promotion was to OBERWACHTMEISTER, Awards include Ostmedaille and Iron Cross Second Class and the OSTVOLK Medaille 2. Klasse in Silver. Saw action in the Poland Campaign 1939, France Campaign 1940 and then BANDENKAMPF actions in the East in 1942 with Reiter Abt. 285. 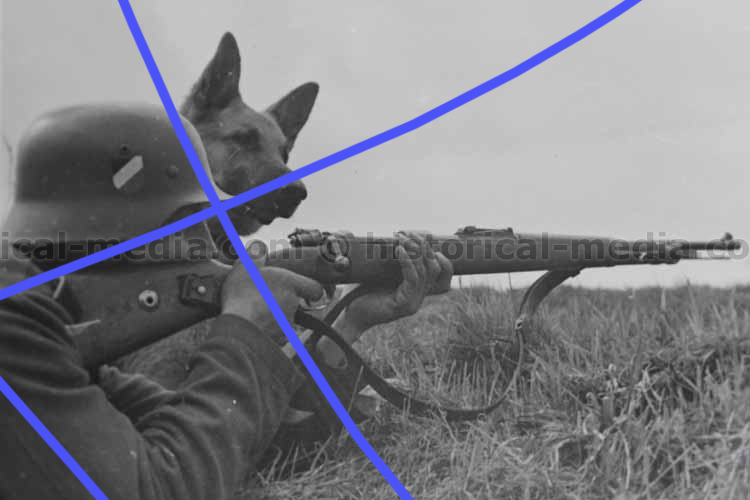 He then fought the ALLIES in BRITTANY with Ost Batl 633 (Festungs Gren Rgt 852) of the 343 Inf Div. until the unit's destruction in BREST in September 1944. AFRIKACORPS PANZER SOLDBUCH & WEHRPASS - Panzer Regiment 8 - TOBRUK + NORMANDY! NICE! 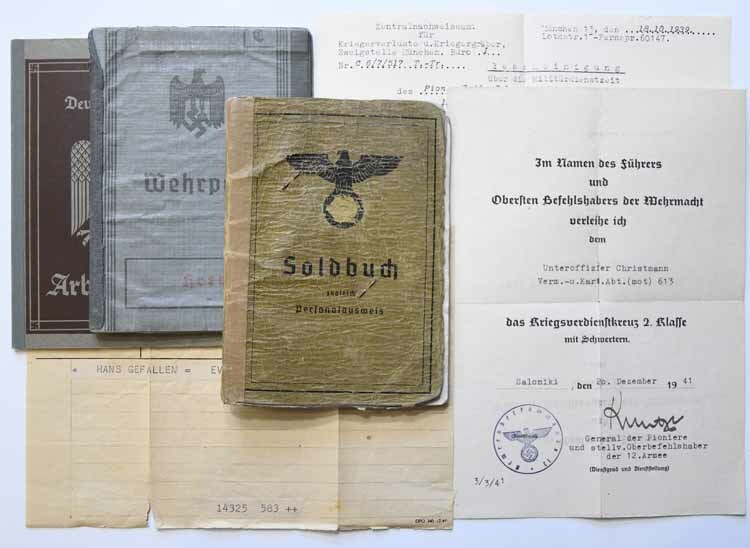 Soldbuch, EK2 Award Document and Infnatry Assault Badge Award Document to Kurt BLAUL who served in Inf Rgt 196 of the 68 Infantry Division. 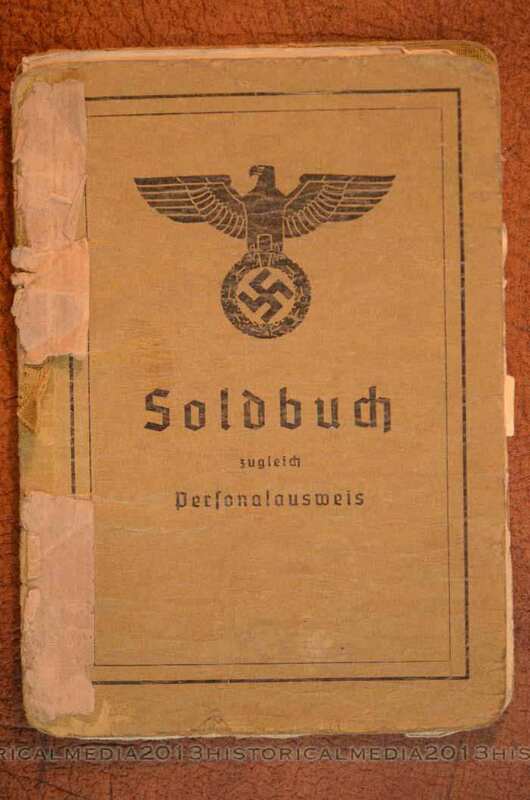 All awards entered into Soldbuch including the Ostmedaille. 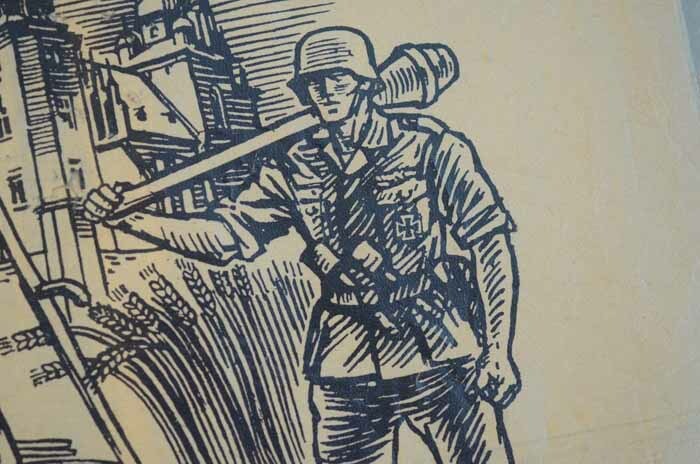 What I really like is the document issued in 1944 which has a soldier holding a Panzerfaust - uncommon! And first time I have seen this document. It is a thank you to soldiers from commander of a Heeresgruppe for his service on the East German border.